Safety in the workplace is more than placing a lid on a coffee cup at a desk or proper use of a push pin. It’s following the right safety protocols to avert injuries in the office, reduce costs to the business, and to provide a safe workplace for employees. That’s why it’s imperative that both management and office employees discuss workplace safety topics and adhere to them. Here are 10 workplace safety topics your employees need to know. Familiarize yourself with potential hazards and hazardous zones in your workplace. Study all available workplace safety manuals in the office that pertain to workplace safety topics. Identifying hazards and being mindful of what areas are danger zones will reduce work-related injuries. Simple choices like watching your stress levels and choosing the right furniture to sit in at your desk can make you more cognitive to workplace surroundings. Workplace stress is the major source of stress for working adults in America. Stress clouds judgment and allows space for accidents, which is why it should be ranked high when discussing workplace safety topics with employees. Bad posture puts more stress on the body, causing fatigue. A stressed body is a fatigued body–physically and mentally. Paying attention to the way you sit and what you sit in will benefit the body the around, making you more alert to surrounding dangers in the workplace. Office burn-out happens when employees feel like the pressure to go beyond the call of duty to empress their employers. This isn’t bad work ethic ideology. However, when employees skip lunch hours and scheduled breaks to press through work projects, burn-out occurs–mental burn-out and physical burnout. When employees are tired they are more apt to make hazardous mistakes in the workplace. Using office equipment the right way saves lives and injuries and is one of those workplace safety topics that should never be ignored. Adhere to the directions and don’t take shortcuts. 34,000 or more injuries occur every year in the workplace related to powered industrial trucks or forklifts. These injuries would happen less often if workers would learn more and pay attention to workplace safety topics. Emergency exits are not just quick ways to get out of the building, they are life savers. Knowing where they are could be the difference between life and death. Be sure to keep those areas clear of debris and other office tools that should be stored in their prospective places. Thousands of work-related accidents could be prevented if office personnel would report odd or suspicious things to their supervisor(s) when they see them. Broken machinery, suspicious packages, and lighting issues–that could be caused by an electrical issue, are all issues that could progress into hazardous situations. When you see things out of order in the office, tell someone right away. It’s a courteous way looking out for another employee. Slip and falls happen where there are spills, wet or slippery floors, and untethered rugs or mats that don’t have traction. Preventing slip and falls is as easy as the golden rule. If you spill it, clean it up. If you see a spill and you recognize the liquid is safe to wipe up, clean it up to prevent a fall. If you notice a hazardous substance on the floor, notify management immediately. 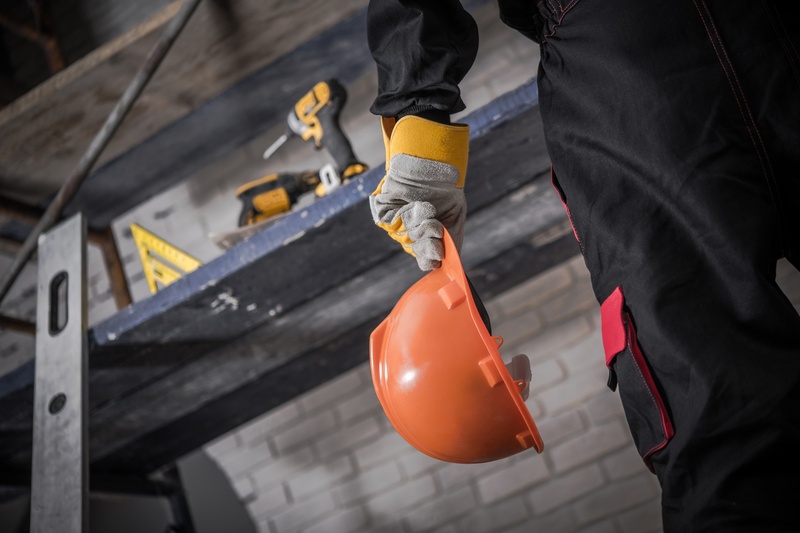 Not wearing the required work gear could lead to serious injury in the workplace. Wearing safety items like goggles, hard hats, and gloves for certain work assignments should be top mention in workplace safety topics. These items prevent personal injury to the eyes, head, hands, and other body parts when worn. Always wear protective equipment. Drugs and alcohol dull the senses. They steal alertness and focus, creating space for injury and dangerous work-related situations. About 16% of employees who end up in the emergency room were drinking on the job, while about 11% of office-related deaths are alcohol-related. Employees who are under the influence of alcohol and drugs are more likely to commit a violent act against another employee. By keeping the workplace a drug-free zone, employees remain attentive and the potential for workplace injuries dwindles. Keeping the workspace clear of clutter and unsafe items wards off possible work-related injury. Remove items like trashcans, purses, backpacks, or any containers that block entryway into your workspace. Most slip and falls happen because of blocked entryways into workspaces. Keep unused file folders in a file drawer or a central filing area. Cluttered desks distract focus. When employees lack focus injury is imminent. Put lids on open containers and keep drinks and liquids away from computers and power outlets. Having an organized work area minimizes possible injury. When it comes to workplace safety topics, a preventative is better than a cure. Work-related injuries affect companies, employees, and employee families. Everyone loses. Educating employees on safety topics that will keep them safe in the workplace will reduce future financial burdens for companies and families. Employees who follow safety protocol and tips help create a sound, safe foundation in the workplace. Discussing simple topics like being attentive to your environment, staying sober, protecting your health by taking your scheduled breaks (to reduce work stress), and knowing safety exits, generates an environment of attentiveness. When employees are attentive they make more intelligent decisions regarding their safety and the safety of fellow office personnel. Teach the see and tell technique. Encouraging employees to report faulty equipment, suspicious items, and electrical issues preempt workplace danger. Also, motivate employees to declutter their work areas. The incentive is a safer environment for all. Check out our guide for more insightful business strategies.